From the popular video game Aliens: Colonial Marines comes this impressive figure of a Xenomorph Crusher! The Crusher is typically black with a dark brown or gold tint to its body and its head is topped with a thick, bony crest. This powerful creature will lower its crest into a vertical position and like a bull, it will charge at its target. This fully articulated Crusher action figure comes with an extendable tongue and exchangeable hands, as well as a stand to display in your collection. 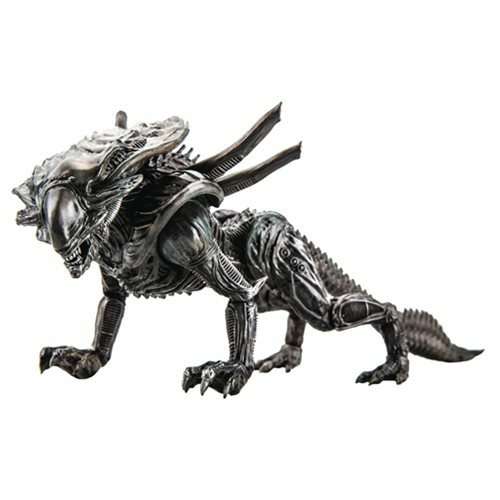 This Aliens: Colonial Marines Xenomorph Crusher 1:18 Scale Action Figure - Previews Exclusive measures about 12-inches long x 5-inches tall.